Londra, anni ’50. Il rinomato sarto Reynolds Woodcock e sua sorella Cyril sono al centro della moda britannica, realizzando i vestiti per la famiglia reale, star del cinema, ereditiere, debuttanti e dame sempre con lo stile distinto della casa di Woodcock. Le donne entrano ed escono nella vita di Woodcock, dando ispirazione e compagnia allo scapolo incallito, fino a quando non incontra una giovane e volitiva donna, Alma, che presto diventa parte della sua vita come musa ed amante. La sua vita attentamente “cucita su misura”, una volta così ben controllata e pianificata, viene ora stravolta dall’amore. Set in the glamour of 1950’s post-war London, renowned dressmaker Reynolds Woodcock (Daniel Day-Lewis) and his sister Cyril (Lesley Manville) are at the center of British fashion, dressing royalty, movie stars, heiresses, socialites, debutants and dames with the distinct style of The House of Woodcock. Women come and go through Woodcock’s life, providing the confirmed bachelor with inspiration and companionship, until he comes across a young, strong-willed woman, Alma (Vicky Krieps), who soon becomes a fixture in his life as his muse and lover. Once controlled and planned, he finds his carefully tailored life disrupted by love. With his latest film, Paul Thomas Anderson paints an illuminating portrait both of an artist on a creative journey, and the women who keep his world running. 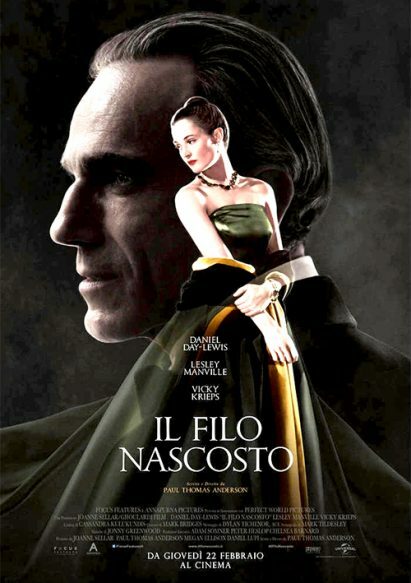 Phantom Thread is Paul Thomas Anderson’s eighth movie, and his second collaboration with Daniel Day-Lewis.